High Falls Creek is a steep, box canyon roughly 26km up the Squamish Valley Road that empties into the Squamish River. The hike is steep, with some technical, almost scrambly sections with chains to assist. When it’s wet or icy, this hike is extremely difficult and dangerous, so it’s best done on a sunny, warm day. The hike begins right on the Upper Squamish Valley Road, about 100m past a bridge over the outlet of a hydro station. It doesn’t linger in the flats and heads straight up, right out of the gates. The trail follows the climber’s left side of the canyon and slowly works its way up rocks and bluffs to well above High Creek Falls. The trail is well marked in some spots with orange flagging but has points along the way that require route finding, especially during the summer months when the undergrowth is in full jungle mode. All along the trail are small viewpoints, many of them signed, that overlook the falls and the valley below. The views on this trail are breathtaking, and it’s best viewed late in the day, when the sun is shining directly on the canyon. Most of the trail is littered with blueberry bushes and if the time is right, usually mid to late July, you’ll be feasting throughout the hike. Just be mindful; when the berry crop is good for humans, it’s good for bears, so keep your eyes and ears open. The trail ends above the canyon on a logging road. Near the end, there is a little route finding in a small area that has been logged, but it’s easy to find a way through, as you can see the logging road beyond, through the trees. This section is not well marked. Once on the road, hang a left and it’s a 5km walk back down to the Squamish Valley Road. 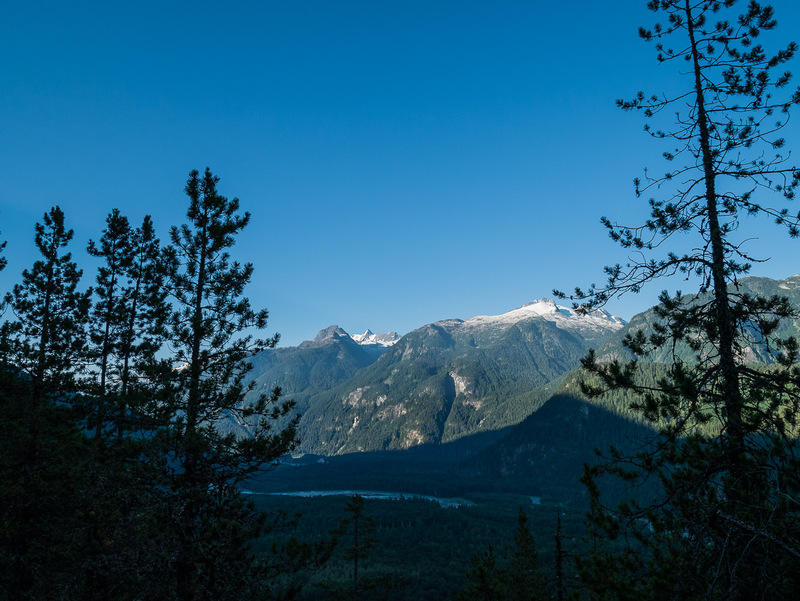 The walk down the road is scattered with fantastic views up the Squamish and Elaho Valleys and makes the road walk a little more bearable.